FilterCart Carbon mobile filter unit is specially designed for extraction of odours. FilterCart Carbon includes Extraction Arm Standard and can be equipped with HEPA filter for maximum efficiency. applications: solvents, fumes and other gas contaminants. 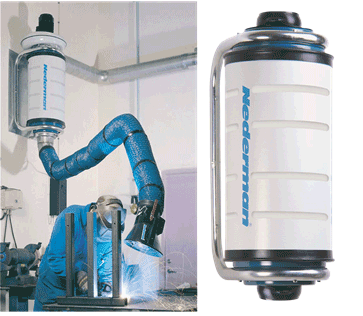 Automatically cleaned for light to medium dust & fume applications. The FilterBox 10 eQ is a mobile unit, equipped with a N24 fan for a maximum air flow capacity of 1 000 m3/h (600 CFM). An integrated silencer reduces noise from the fan and outlet air. The unit has an advanced filter control system with automatic cleaning that starts when the air flow is too low. FilterBox 10 eQ also has a pneumatic outlet for pneumatic tools and a single phase power supply output for electric tools. As soon as the tool starts, the fan starts automatically. There is an additional grip included to easily maneuver the unit. Additional protection from harmful particles is provided if a HEPA filter is installed. For dust applications, the unit is cleaned mechanically. For welding fumes it uses a combination of mechanical and compressed air cleaning. For welding applications, compressed air cleaning is required. Note! FilterBox is not for use in environments where combustible dust or gases are present, and it is not for use in filtering combustible dust or gases. The Fume Eliminator (also called a Smoke Eater) is designed to be carried to the working area. Connected to a welding torch or to an extraction nozzle, the FE unit extracts the fume directly at source. FE 840 has a manual start/stop function while the FE 841 has an automatic start/stop function, which starts the unit as soon as the welding begins. 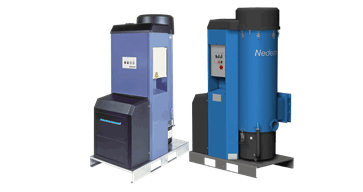 The Nederman L-PAK offers the ideal solution for removing dust and fumes in all types of industries. Typical areas of applications can be found in welding shops, car body shops, construction industries, bakeries, industrial laundries, etc. The L-PAK is also perfect for cleaning of the workplace and the workshop floor. The L-PAK is easy to position and move due to its compact design, its low weight and the frame for fork lift handling. The integrated PLC-control ensure high functionality and can easily be updated with new functions. The automatic start/stop will save energy as well as extend the lifetime of the unit. The remote start/stop function makes it easy to ensure that everything is shut off when you go home from work. Safe use The duty idling and the temperature control functions reduce the risk of the fan getting overheated. There is also an indicator to show when service is required. Unique and economic filter concept The filter concept in L-PAK is unique as it combines high filter efficiency with long lifetime. A dynamic reducer separates coarse particles. Fine particles are separated on surface treateda long lifetime. The polypropylene fine filter can easily be replaced by an antistatic filter if needed. You may also add a micro filter to filtrate even the finest particles. Automatic filter cleaning as standard. Continuous high performance is obtained by automatic filter cleaning (as standard). L-PAK uses filter cleaning by a short blast of reversed atmospheric air. By the rapid opening of a valve located on top of the filters, a powerful air pulse is created, efficiently dislodging dust from the filter socks. Complete and ready to use We can deliver complete installations but if you prefer to install your own system, this is very easy to do. 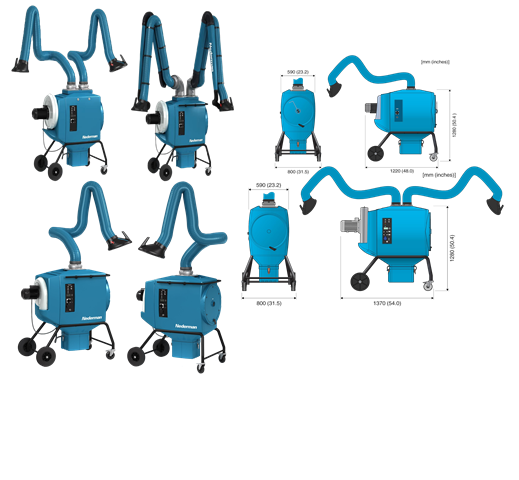 Nederman can also offer a vast range of accessories like cleaning equipment, vacuum valves, swing arms and grinding tools with integrated fume and dust extraction. The compact E-PAK for multi-purpose useThe ideal solution for the extraction of sanding and grindingdust and for welding fumes. Also suitable for cleaning of theworkplace and the shop floor. The E-PAK is a powerful vacuumunit and can serve up to six extraction points, all in use at thesame time.Typical areas of application can be found in welding shops,car body shops, construction industries, bakeries, industriallaundries etc.Power control can be obtained by fitting automatic vacuumvalves to the extraction points. The valves provide suction powerwhen an operation starts. When the work stops and all the valveshave closed again, the E-PAK unit will stop.Low operating costsAutomatic vacuum valves offer substantial energy savings andmake a small unit manage the job otherwise requiring a largeunit. Using automatic valves multiplies the number of workingpoints that can be served, by three to four times.Low noise level is an obvious demand in today’s workingenvironment. E-PAK is developed to fit into normally noisesensitive premises thanks to efficient silencers and acousticenclosure. The enclosure is easily removed for service.Complete and ready to useWe can deliver complete installations but if you prefer to installyour own E-PAK system, this is very easy to do. We can alsooffer accessories like cleaning equipment, vacuum valves, swingarms, welding guns and grinding tools with fume and dustextraction. For welding extraction, on-torch or nozzles. Semiportable installations. Unit including Nederman FlexFilter cyclone for coarse separation. Manual start/stop. The units have four 100mm (4 in) diam. for the C-PAK 20-1500 and 160mm (6.3 in) diam. for the C-PAK 20-2500 vacuum inlets with connection flanges suitable for the Nederman PAK hose and coupler system. Flow restrictor and combined back flush/start-up valve is standard. The leading extraction solution. Always the right capacity. 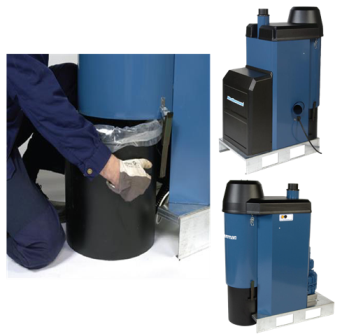 The FlexPAK high vacuum unit represents the foremost solution on the market. 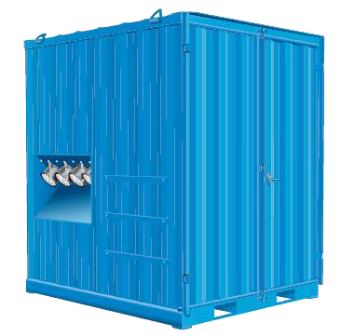 The unit is designed for the extraction of welding fumes, grinding dust, metal chips etc. FlexPAK is suitable for cleaning the workplace, the shop floor, and machines. FlexPAK regulates the speed of the motor automatically depending on the vacuum demand. Compared to traditional controllers, FlexPAK provides an optimal, and well-balanced vacuum according to the need, ensuring energy-saving operation. The filters are effectively cleaned by applying powerful air bursts to the filter through quick opening valves. The dust is knocked off by the impact and collected in the dust bin. The sequence is controlled by the PLC, and it can be adjusted to suit every installation. This maximizes the life of the filter and ensures the correct functioning of the unit. FlexPAK can be fitted with different types of alarms, for example, level monitors for waste containers, filter indicators (for clogged filters) and fire alarms. Alarms can be activated at A and B levels and can be set to give both visual and audible signals. 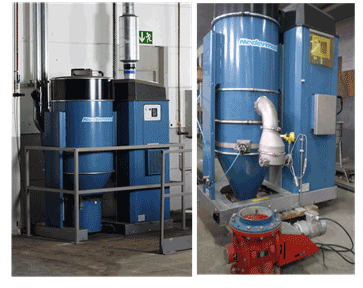 FlexPAK800 is a high vacuum unit, suitable for applications where metal chips, shot blasting grit and other heavy material need to be removed. 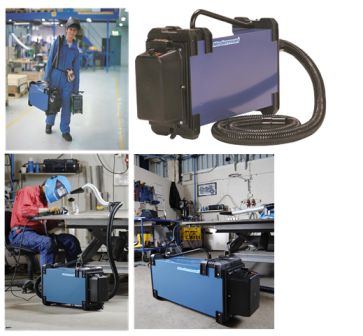 FlexPAK1000 operates at a lower vacuum level and is suitable for extracting welding fumes and grinding dust and for use where a constant airflow, independent of the number of users, is a requirement. The configuration of modules will be similar to 570A which are aimed for the toughest applications, for example handling a lot of abrasive and heavy material. The robustness of the unit and the power from the reliable ejector makes the unit very suitable for many applications where many industrial vacuum cleaners can not be used. For example to collect blasting material in blasting hall, sand recovery in foundries etc. Your unit can be configured to meet your specific demands. Different ejectors can be used depending on the demand but also the availability of compressed air. The ejector can be placed on a mobile silo with filter, with wheels and forklift slots. Nederman has a range of different discharge valves that can be fitted to the silo for easy discharge of the collected material. If handling larger quantities of material, Nederman recommends using a pre separator before the vacuum unit. See Nederman Engineering Guide for more information. 1. Select ejectormodule depending on required vacuum and air flow. 2. Select filtermodule depending on filter capacity. Ensure you meet all requirements for your modules. The height of your configuration is depending on what filtermodule you choose. The configuration of modules will be similar to 570A which are aimed for the toughest applications, for example handling a lot of abrasive and heavy material. 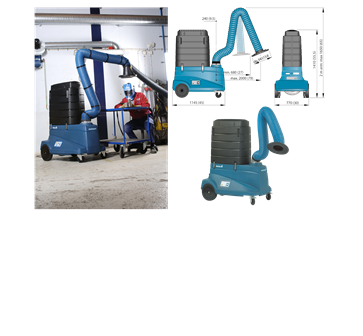 The robustness of the unit and the power from the reliable ejector makes the unit very suitable for many applications where many industrial vacuum cleaners can not be used. For example to collect blasting material in blasting hall, sand recovery in foundries etc. Your unit can be configured to meet your specific demands. Different ejectors can be used depending on the demand but also the availability of compressed air. The ejector can be placed on a mobile silo with filter, with wheels and forklift slots. Nederman has a range of different discharge valves that can be fitted to the silo for easy discharge of the collected material. If handling larger quantities of material, Nederman recommends using a pre separator before the vacuum unit. See Nederman Engineering Guide for more information. Use modules linked to 570A, configurable product only. You may only choose ejectormodule, filtermodule, silomodule and discharge valve 1. Select ejectormodule depending on required vacuum and air flow. 2. Select filtermodule depending on filter capacity. 3. Select silomodule. 4. Select discharge valve. 5. Select cleaning equipment. Ensure you meet all requirements for your modules. Control system with many different functions is available as an accessory The height of your configuration is depending on what filtermodule you choose. 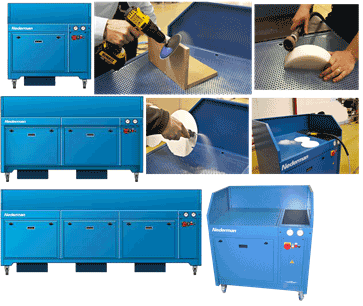 The FilterBench is a self-contained downdraft table and is available in three different sizes. The FilterBench is used for extraction and filtering of dust from materials like composite, plastic, fiberglass and wood arising from lighter processes such as sanding, de-burring, linishing, fettling, ingredient weighing etc. Easy to use and always with extraction at hand. The FilterBench should not be used in an environment with danger of explosions or for dust in explosive concentrations. The FilterBench should not be used for hot or spark generating processes such as welding fumes or metal grinding. 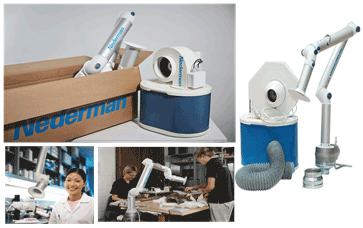 Nederman Bench Top Extraction kits provide a quick and convenient solution for creating a fume-free workplace. The Bench Top extraction kits includes arm(s) with hood or nozzle, fan with speed control and standard filter (particle, HEPA or gas), hose, connection details, and table bracket. The speed of the fan is variably controlled by a speed controller. Complete with hoses and extraction hoods. The hood is made of clear plastic, which increases the visibility. The Modular Filter System simply solves the need of cleaning the air from particles, smoke, dust, gases and smells. The modular construction means that the system is suitable for both small workspaces and larger manufacturing works. By supplementing with Nederman fans, extraction arms and control boxes, you can build up a solution for every workplace. Typical applications are TIG and spot welding, laboratory extraction, food ingredients and odours and chemical handling.